A recent paper from our group, in collaboration with Luciano Costa’s group at Fluminense Federal University (Brazil) and Burcu Gurkan’s group at Case Western Reserve University, has been featured by the Joint Center for Energy Storage Research (JCESR). 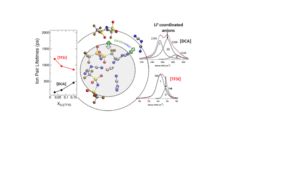 In this paper, our team used Raman spectroscopy and molecular dynamics (MD) simulations to study the structural and dynamical changes in the solvation shell surrounding Li+ in a ternary electrolyte is composed of a mixture of two ionic liquids (ILs), n-methyl-n-propylpyrrolidinium bis(trifluoromethanesulfonyl)imide ([PYR13][TFSI]) and 1-ethyl-3-methylimidazolium dicyanamide ([EMIM][DCA]), and a lithium bis(trifluoromethanesulfonyl)imide ([Li][TFSI]) salt (0–1 M). The local structure of Li+ in this eutectic was found to be heterogeneous and preferentially solvated by [DCA]. The Raman and MD analyses suggest a wide distribution of solvation. The computations showed increased ion pair lifetime for Li+ –[DCA] and decreased lifetimes for Li+–[TFSI] in the ternary mixture with the increase in the [Li][TFSI] concentration. These results show that the solvation and transport properties of charge carriers in ILs can be modified via the presence of multiple ions with varying degree of coordination, which provides an approach to impact the performance in electrochemical processes.